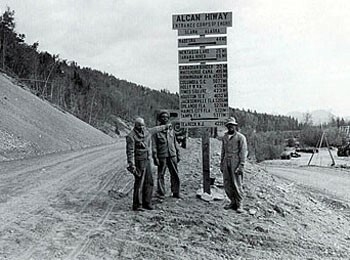 On February 13, 2003, Cheryl Cattledge, Civil Rights Specialist and member of the FHWA Black History Committee, sponsored a Luncheon Program entitled The ALCAN (Alaska-Canada) Highway, Built by World War II Black Regiments. The committee members who helped Ms. Cattledge organize the event are Ilze Abolins, Tashia Clemons, Rise' Stevens and Charles Wilkins. As a morale booster the men made a mileage sign post listing their hometowns, mostly in southern states, and the distance from home. Jacksonville, Florida, for instance, was listed as 5,206 miles. Photo provided by Phil Oglesby III. Acting Division Administrator Larry Anderson welcomed the guests and luncheon speaker, M. "Phil" Oglesby, III. Mr. Oglesby is a well-known figure in the Ohio construction community. He is the chairman of the Ohio Contractors Association and president of his own company, Sandusky Bay Construction. In his presentation Mr. Oglesby talked about the 3,695 black soldiers of the 1,670 who participated in the construction of the 1600-mile inland road called the Alaska Military Highway. Built to secure Alaska, via an inland route, after the Japanese attacked Pearl Harbor in December 1941, the highway stretches from Dawson Creek, British Columbia, to Fairbanks, Alaska. 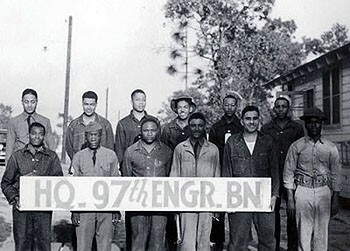 Troops of the World War II Black Regiment who helped build the ALCAN Highway. Photo provided by Phil Oglesby III. Mr. Oglesby presented the racial and physical problems the troops endured while building the ALCAN Highway. Military policy during World War II decreed that blacks would not be sent to northern climates or active duty, but manpower was scarce with the war in progress and segregated troops were shipped north under the leadership of white commanders. The soldiers worked 12 to 14 hour days, seven days per week, enduring mosquitoes and black flies in summer and below zero temperatures in the winter. In the spring, "The Big Thaw" presented mud problems for the workers. There was never enough equipment to work with and communication with the outside world was practically non-existent. The men's clothing was designed for 40F temperatures, but often the temperature was minus 72F. Water was heated in helmets and the soldiers slept in six men pyramid tents. Despite the harsh conditions, construction on the highway, which began March 8, 1942, was finished only eight months later on October 25, 1942. 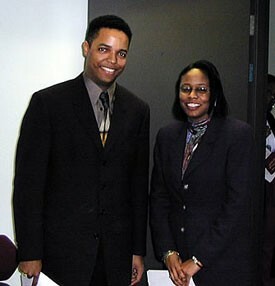 Phil Oglesby III and Cheryl Cattledge, Ohio Division, at the Black History Presentation Luncheon.